DEER TRAIL, Colo. A tiny town in Colorado's Eastern Plains is declaring war on drones. The town of Deer Trail plans to begin issuing drone hunting licenses if a controversial ordinance passes Tuesday night, CBS Denver reports. Deer Trail resident Phillip Steel, whose house is surrounded by no trespassing signs, wrote the ordinance to protect individual privacy rights. "We don't want a surveillance society here." Steel said. Steel says drones are too powerful and too intrusive. He fears drones will become more prevalent in the skies in the coming years, but admits he hasn't ever seen a drone flying over Deer Trail. "Right now we don't have drones flying in our skies, great," he said. "We want to keep it that way." So Steel authored the first ever "no-drone zone" ordinance which gives individuals with licenses the right to shoot down a drone flying over Deer Trail with a shotgun. Deer Trail also plans to offer a cash bounty for pieces of shot down drones, which they will call trophies. "If you don't want your drone to go down, don't fly in town." Steel said. "That's our motto." Deer Trail Mayor Frank Fields agrees with Steel and believes the Drone hunting ban will pass. "Using it against terrorists is okay, but we don't need to be using it in our little towns, peeking in windows and stuff," Fields said. Fields says the proposed ordinance is "kind of real, kind of tongue-and-cheek." He sees the ordinance as an opportunity for revenue. He says 157 people have already signed up to be the first to get a drone hunting license at $25 each. He also thinks drone hunting could bring tourists and souvenir shops to Deer Trail. "We need business, we need money," Fields said. The mayor is considering holding drone hunting events if the new ordinance passes. But the 548 people in Deer Trail are divided. Even some families are split when it comes to drone hunting. Young mother Clarice Hoffer said, "To be perfectly honest I don't think it's a good idea." She would rather Deer Trail remain known for being the home of the world's first rodeo, rather than drone hunting. "Most of the people I talk to don't want it." Hoffer's husband, Wesley, calls the whole thing "goofy." "If people want to pass an ordinance and pay $25 for a drone license, I'm not going to stop them. That's their business." Wesley Hoffer said. He says he would be shocked if anyone would ever want to fly a drone over Deer Trail. Small-business owner Chris Miser takes the drone hunting issue seriously. Miser learned to fly drones in the Air Force and has now started a civilian company, Falcon UAV (Unmanned Aerial Vehicles). 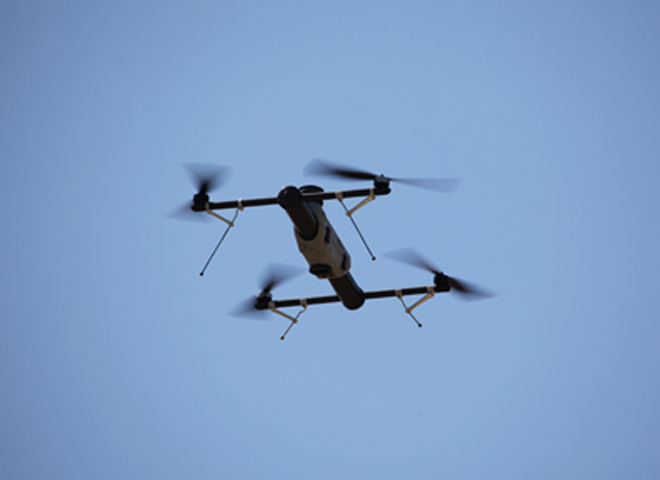 "I think it's more related to the perceptions that are related to military UAVs, however those negative connotations are being brought to the civil industry," Miser said. Miser says drones can "save money, save lives and make money." At Falcon UAV, Miser helps farmers and ranchers monitor their crops and livestock from the sky. He also works with the Mesa County sheriff, who uses his aircraft for search and rescue missions. Miser says Deer Trail's drone hunting ordinance is misguided and reckless. "Why would you want to point a gun in the air and shoot it straight up is comical to me, especially inside city limits," he said. But that's exactly what Steel and Fields say could happen if a drone were to fly over Deer Trail after the ordinance passes. "If I had written this drone ordinance to be just a twice-a-year turkey shoot, who would care?" Steel said. Steel says he would be the first to shoot down a drone if it enters Deer Trail's airspace. "This is a law because that is how it has been able to capture the imagination of the entire country," he said. And even the mayor, who supports drone hunting because of the publicity buzz it is generating, says he would pull the trigger as well. "We'll have to shoot it," Fields said. "Well, that's the law, if it passes."